Minister of State for IT Ms. Anusha Rahman has said that Telecom Foundation should concentrate on new avenues to enhance the volume of its business activities. 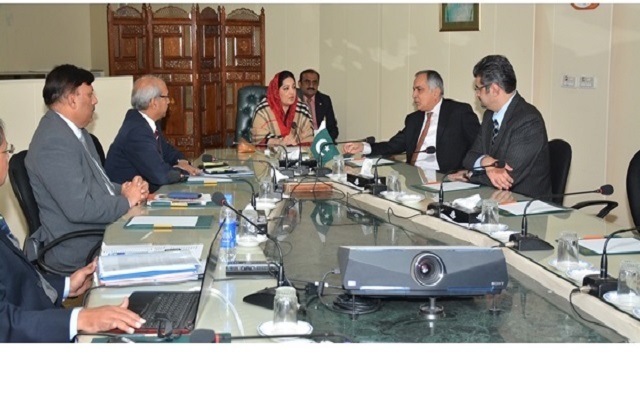 She was chairing a performance evaluation meeting of Telecom Foundation (TF) & Pak Datacom in Islamabad. Federal Secretary IT Mr. Azmat Ali Rangha, MD-Telecom Foundation Maj. Gen (R) Muhammad Khalid Rao, Chief Executive Pak Datacom Mr. Arshad Kiyani, Member (Telecom) Mudasar Hussain and other senior officials from TF and MoITT were also present in the meeting. MD TF, apprised the Minister regarding the new initiatives being taken by the Telecom Foundation, which includes subsidized education to the children of serving and retired employees of telecom sector in 12 T.F schools all over the country and educational and vocational technical trainings through TF Institute of Technology & Management, which is functioning under administrative control of Telecom Foundation and offering three years diploma’s in the fields of Civil, Electronic and Telecom Engineering. The Minister directed the T.F authorities to have a close liaison with the Telecom service providers working here in Pakistan and improve the curriculum of vocational training diplomas in accordance with the requirement of the market so that maximum diploma holders could get jobs after completion of their respective diplomas. The Minister also desired that volume of welfare activities of TF should also be enhanced because it is a charitable organization and welfare activities are amongst its core objectives. She also desired that a “Welfare Hospital” should be established in collaboration with public private partnership on 26 kanal land which TF is having in sector H-8, Islamabad, near Shifa Hospital. Chief Executive Pak Datacom also apprised the Minister regarding their ongoing projects which includes data connectivity to FBR. Minister was also informed that International Companies have also shown their interest to work with the Pak Datacom.